The Russian government has observed May 24 as the Day of Slavic Writing and Culture since 1991. This year, the occasion was observed at the Russian Centre of Science and Culture with a series of events including an exhibition of books and an exhibition on creators of the Slavonic script, Saints Cyril and Methodius. 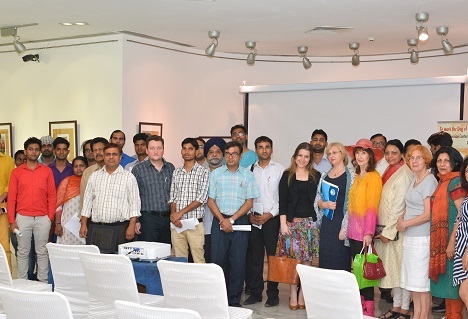 The Day of Slavic Writing and Culture, which the Russian Government has been celebrating since 1991, was observed marked at the Russian Centre of Science and Culture (RCSC) in New Delhi on May 20, 2015. The function was jointly organised with the Russian Language Teachers’ Training Centre. There were a series of programmes both in the morning and evening to mark the occasion. The morning programme comprised a presentation for Russian language students, a book exhibition and an exhibition of children’s work, the “Decorative Russian Alphabet”. An exhibition dedicated to the Day of Slavonic Script and Culture “St. Cyril and Methodius; Equal to the Apostles; the Creators of Slavonic Script” was inaugurated in the evening, with a talk on the Christian missionaries; Saints Cyril and Methodius; credited with devising the Cyrillic alphabet. A multi-media presentation on “Russian monasteries as centres of medieval literature, education and culture,” and a film show on the celebration of the Day of Slavic Writing and Culture in Russia and abroad also formed part of the evening’s programme. Among those who participated in the functions were Professor Ramadhikari Kumar, President, INDAPRYAL, Dr. Neelakshi Suryanarayan from Delhi University, Ms. Danijela Matijas, Attache with the Serbian Embassy, Ms. Milena Nikolova, Second Secretary, Embassy of Bulgaria, Ms. Tatyana Perova, Head of the Russian Language Teachers’ Training Centre, Mr. Sonu Saini, Assistant Professor, Jawaharlal Nehru University, and Mr. Aakshat Sinha, Representative of Indian Association of Alumni of Russian/Soviet Academic Institutions. Tracing the background on the affinity of Slavic and Sanskrit words, Kumar described the meeting and interaction between the Aryans and Slavs across Central Asia in earlier centuries. Matijas pointed out the resemblance in the pronunciation of equivalent words for ‘pocket’ and ‘almond’ in the Sanskrit and Slavic languages, to the great amusement of the audience. In her comprehensive address, Perova described the enlightening life, travel and monumental work of St. Cyril and St. Methodius. She spoke of their efforts and unique contributions to the evolution of Slavic writing and culture, which turned into a phenomenon in the linguistic world.